Atomic force microscope (AFM) evaluates morphology of surfactant layer formed at a solid/liquid interface as well as additional information of the adsorption layer such as thickness and compressibility. The morphology can be visualized when a probe tip (cantilever) is scanned at a given repulsive set-point force arising from the adsorbed surfactant layer. This AFM observation method is called “soft contact method” due to its non-distractive nature to the soft materials. In force curve measurement, the separation “0” is defined as the constant compliance region where the cantilever and base substrate move together. Special care is required for the separation definition; if the adsorption layer is stacked like a sandwich between the cantilever and the base substrate, it would not be pushed out by compression. Spherical particles can be placed on the cantilever tip to measure the force and friction curves. 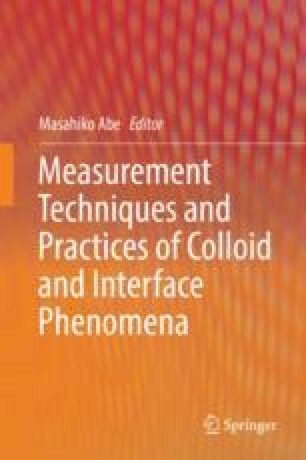 This procedure is called “colloid probe method” and is useful in determining the interaction surface energy under the Derjaguin approximation.